I received a copy of Amanda in Alberta: The Writing on the Stone from the author in exchange for my honest review. If you haven’t met Amanda before, you’ll need to know she is a twelve-year-old, adventurous, travel-loving girl who seems to find mysteries wherever she goes. This time, in Amanda in Alberta: The Writing on the Stone, not even the one leaving home she still gets involved in a situation. Amanda invited Leah, her friend from England, to vacation in Alberta, Canada. For Leah – as it was for Amanda when she visited Leah in England – so much seemed strange to what she was accustomed to at home. Amanda’s parents are busy people but make time to take the girls to various interesting places, such as dinosaur museums, a cattle drive, and unique stores for shopping for “cowboy” attire. While they were at a rodeo, Amanda noticed a little stone drop out of a clown’s pocket, but she couldn’t get the man’s attention to tell him. When she picked up the stone she noticed unusual markings on it, so she slipped it into her own pocket. Things happen from then on to make Leah’s vacation one to remember! Cowboys argue over something, a surly bothersome man keeps following her, she is suspicious of ‘questionable’ people – and Amanda and Leah are involved in another sometimes dangerous adventure. Darlene Foster‘s writing is suited to young readers. The Amanda series is fast-paced, action-filled, and written so that the young main characters are the real problem solvers but with adult involvement. You can read my reviews of two books in Darlene Foster‘s Amanda series: Amanda in Arabia: The Perfume Flask, and Amanda in England: The Missing Novel. 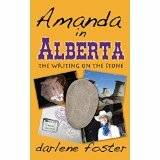 You can find Amanda in Alberta: The Writing on the Stone listed on my BUY THE BOOK! page. This entry was posted in Mostly About Reading, Reviews & Interviews and tagged adventure, Alberta, Amanda series, Canadian author, Darlene Foster, dinosaurs, fiction, middle grade, suspense, western Canada. Bookmark the permalink. Thank you once again for sharing Amanda with your readers. I am pleased you enjoyed the adventure and learned a bit more about where I grew up.I believe you have a daughter who lives in Calgary. You’re welcome, Darlene. Actually, one of my daughters lives in Grande Prairie. Alberta. This sounds like a delightful book for my granddaughter. Yay! 😀 I already have this one on my To Be Read pile! !